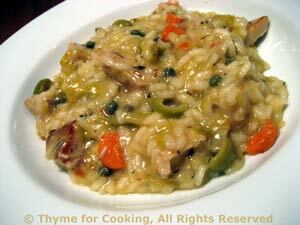 Risotto with Roast Pork, Olives and Capers, Thyme for Cooking easy supper. This is made with the leftovers from the Braised Pork with Leek Sauce, with gives it the darker color. Notes are given at the end for making it without the leftovers. The carrots add color and crunch; the olives and capers add tartness and lighten the Leek Sauce. Before the last 1/3 cup taste a few kernels of rice. They should be just 'al dente' - slightly resistant to the tooth but fully cooked. If more stock is needed add it 2 tbs at a time and waiting until almost completely absorbed. At this point risotto will be thick but not stiff - there will still be visible liquid and it will not hold its shape on a plate. Peel the carrot and cut in half the long way. Slice carrot thinly into half circles. Remove pork and add carrots. Sauté carrots until tender. Pit olives if necessary and cut into thirds. Return pork to skillet and add the rest of the ingredients, including the Leek Sauce. Heat through. Cover and keep warm until needed for risotto. Note: To make without leftovers use 6 - 8oz (200gr) pork or one chicken breast, cut into small pieces and sautéed in a bit of olive oil, add 1/2 onion, sautéed, and increase hot chicken stock by 1/4 cup.